There’s a woolly hat revolution and it all started with Misti Alpaca Chunky. It all happened by accident when Wild Fire Fibres and I were simultaneously knitting hats. Since it’s been so cold this winter, I’ve taken to wearing hats inside to keep warm. Unfortunately, all my hats are pre-Purl City Yarns, so I wanted to knit something in a Purl City Yarns yarn to wear at work. So, I started knitting Woolly Wormhead’s Waffle Slouch hat in Mirasol Akapana and Wild Fire Fibres was, unknown to me at the time, creating her own hat design, which I get to test knit! I was completely taken with the Akapana as soon as I opened the box, which says a lot because it doesn’t come in pink. Nevertheless, I’ve been wanting something a bit more neutral and the colours are lovely, with the tweedy flecks adding just that little something extra. It’s also an absolute dream to knit with and wear! The Waffle Slouch is also a great pattern; all you really need to know is how to knit, purl, yarn over and knit 2 together and you have a great slouchy hat to keep you warm this winter. 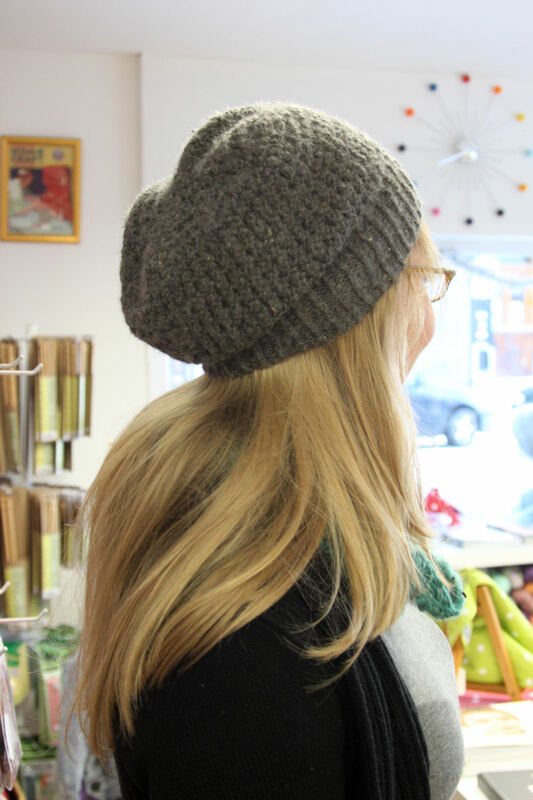 Around the time I was finishing the Waffle Slouch, Vikki came in with a hat of her own creation in Misti Alpaca Chunky. I’ve never seen anyone so happy to be wearing a hat, and I believe the main source of happiness came from the pom-pom, which to be fair, makes the hat. 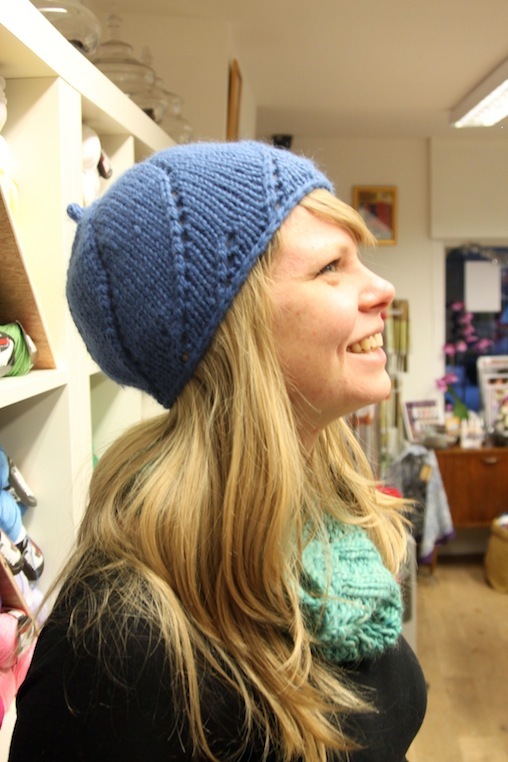 I’d had my eye on a particular shade of blue Misti Alpaca Chunky and shortly after seeing and having a feel of Vikki’s hat, Ysolda Teague announced she was putting her Icing Swirl Hat on sale. The first thing I thought was how cute the hat would look in the blue Misti Alpaca and immediately bought the pattern. The final sign to confirm that I needed a blue Misti Alpaca hat came when I read the Icing Swirl Hat materials, “Approximately 100yds / 90m chunky / bulky yarn. Shown in Misti Alpaca Chunky [my own emphasis] (100% alpaca, 108yds/ 99m, 3.53oz / 100g).” It was meant to be. I made a size small Icing Swirl Hat and still have some yarn left over. I’ve heard from various people, and read on Ravelry, that the larger size takes EXACTLY one skein of Misti Alpaca and you will only have a string left after you bind-off. My Icing Swirl doesn’t seem to be as slouchy in the back as it looks in the pattern photo, so I will probably add an extra round or two to my next one. It’s also an insanely fast knit! Seriously, it took a matter of a hours; I think I possibly watched two movies and it was done. And, Misti Alpaca Chunky is like butter to knit! I spent the entire time knitting thinking of how I wanted a blanket or a body suit made of Misti Alpaca because it’s that soft and amazing (I think I thought about it so much I couldn’t even tell you which two movies I watched when I was knitting it). I just want it next to my skin, all the time. That’s how the hat revolution (aka hatolution) began. So far, it’s a small revolution, but Vikki and I have been trying to persuade Rubbish Knitter to join, and you should too. Now I look at hats as an accessory and think about what clothes I have that will look nice with certain hats. I even plan on knitting another Icing Swirl Hat in red because a red hat would really bring a lot of my outfits together, with the added bonus of staying warm. You just can’t go wrong with utilitarian fashion accessories.